The NFL’s confusing new helmet rule drew plenty of deserved attention and criticism during the preseason, but for all the plays and games it is going to muddy up, it is not the worst rule change implemented by the NFL this season. That honor belongs to the rule that heavily penalizes defensive players for landing on the quarterback. 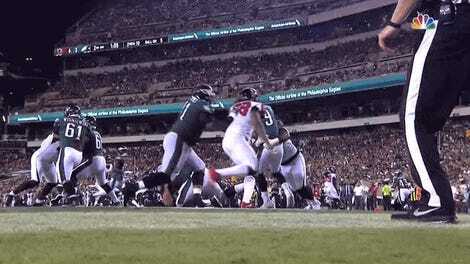 The new rule popped up during the preseason, but it made its regular-season debut last night when Falcons lineman Grady Jarrett made a perfect form tackle while attempting to sack Nick Foles and was penalized for roughing the passer. As we mentioned last night, it’s not clear what Jarrett was supposed to do there, other than levitate, to avoid receiving a penalty. This particular play was easy to brush off as just another blip in what was a sloppy and pretty boring opening night game, but think about how awful it’s going to be when this penalty is getting called multiple times per week. There are plenty of things to complain about when it comes to the experience of watching football, but the thing that keeps getting worse every season is how difficult it is to enjoy displays of athletic greatness in the moment. You see a brilliant catch along the sideline and you want to holler and high five someone, but was it really a catch? Is the cool thing you just saw actually not cool at all because the tip of the ball, like, jostled slightly in the receiver’s hands? Please wait five minutes while various slo-mo replays play out on screen to find out. There are fewer and fewer plays in football that are immune to this kind of epistemic drudgery, and until this year a nice, crisp sack was one of them. A sack has long been one of my favorite plays in football, not only because of its ability to greatly alter the fate of a drive and entire game, but because it often acts as a release valve for an entire game’s worth of tension. You sit there for hours watching your team’s defense kill itself just to try and put a hand on the quarterback, and then suddenly a linebacker comes free and he’s planting that sucker right into the ground. It rules! Nothing about watching football feels quite as good as jumping off the couch and pumping your fist at the sight of a drive-killing sack. And now that is all ruined, because now every sack is going to trigger that little mental hitch, that soul-deadening moment of hesitation that denies the thrill on which the very reason for watching sports in the first place is built. Defenders cannot touch a quarterback’s head, or his knees; now they cannot wrap them in their arms with a perfect form tackle and bring them securely to the ground, and we can no longer truly enjoy the sight of them doing so. Football has once again found a way to get just a little bit worse.